IPad Quirky? Unstable? Manage your storage! Your iPad, has a limited amount of storage. You may recall hearing that it had: 16 Gig, 64 Gig, 128 Gig (Gigabytes). 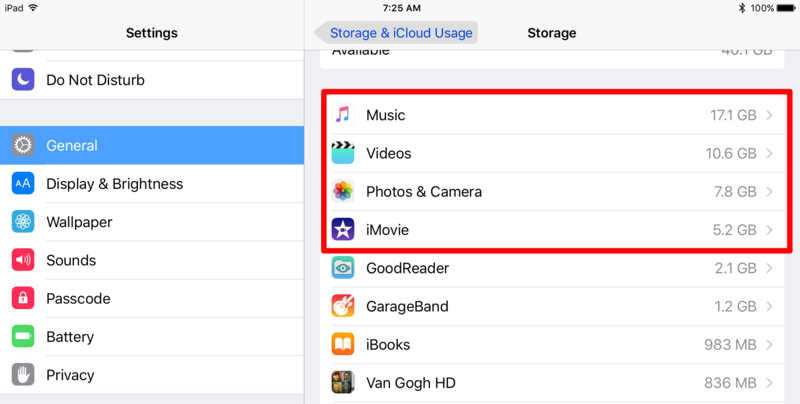 Depending on what you do with it, that storage on your iPad gets used by photos, songs, movies, books, and everything else. If the iPad gets slow, undependable, crashes, or won’t install the latest iOS update, chances are the storage space (whatever it was originally) is all “filled up”. A trip to visit your local Apple Store, or Apple Dealer, or friendly, knowledgeable consultant may be in order. But first, you can try clearing out some space yourself. What’s a Gig? A Gigabyte is a thousand Megabytes. What’s a Megabyte? In the PaleoMac days of the PC revolution BI (Before iOS), early adopters and PC enthusiasts liked to throw around numbers the way auto afficianados today talk about the doomed-wheeled-hunks-of-metal-and-plastic that will soon be replaced by autonomous cars. Those PaleoGeeks made hilarious comments like, “I upgraded my Mac to 512K RAM and bought an external 10Meg SCSI Hyperdrive.” If you’re a Facebook user, or an “elliptical” (as the media calls this new generation), you don’t care what a Megabyte is, and it doesn’t matter. So forget the details. Just remember, as always in capitalism and technology: more is better. When you buy your next Apple device, try to get the one that has *more*. Eventually, even that won’t be enough, but for now, that’s all you need to know. This will take you to a panel that displays your “Used” and “Available” storage (below). There is no hard and fast rule here, but you want the “Available” number to be big. (If it is already 5 Gig or more, then storage is probably *not* what is causing your problems.) Next, let’s make more storage available by getting rid of stuff that no longer serves you. It may take some time for your device to fill in the details of your “Storage” panel. Be patient. Eventually, you will get a list of your apps and how much storage they use—sorted from biggest data usage to smallest. You can go through all of these apps, but you are going to get the best results by working on the apps at the top of the list, which are usually Music, Videos, and Photos (below). You’ll get a list of all the music on your iPad, grouped by Artist, Album, and Song. You can start deleting right at this “top” level, and Delete all songs by one artist. Tap on one Artist, and Slide to the LEFT, to reveal the “Delete” button. Tap “Delete” to delete all the songs by that artist. Don’t want to get rid of everything by that artist? Just want to delete one song? 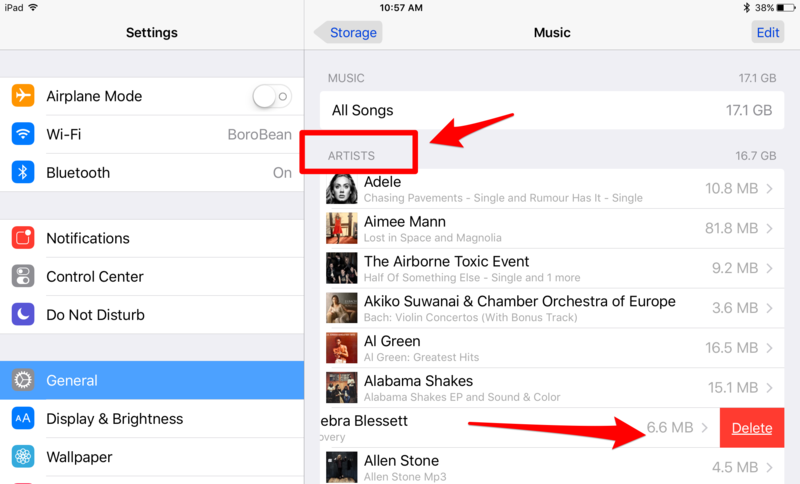 You can “drill down” and use the same method as above to Delete specific albums or songs. Below, we tap Artist “A.C.Newman” > Album “Shut Down the Streets” > Song “Encyclopedia of Classic Takedowns” and then Delete. Hold the “Sleep/Wake” button down until the screen goes dark and you see the “Slide to Power Down” button on the screen. After the iPad completely shuts down, wait 30 seconds, and power it back up. How? Hold down the Sleep/Wake button until the Apple logo appears. NOW, with that extra space that you’ve saved, does your iPad behave better? If not, you could try re-installing the OS, but for most people, that means it’s probably time for a visit to your local Apple support person. This post was written (almost) entirely on an iPad using Evernote. Interested? Tell me. This entry was posted in Commentary, History, Tips and tagged Apple, BI, Christo's 2nd Law of Computing, ellipticals, Facebook, Humor, iOS, ipad, iphone, iTunes, Macintosh, Millennials, PaleoGeeks, PaleoMac, Storage on March 9, 2016 by christoplummer.